The Goodchilds of Grundisburgh were four brothers and a little-known cousin, all born in the village, who served in the First World War. Three of the brothers volunteered for Kitchener’s New Army in 1914, and they wrote 300 letters to their mother in rural Suffolk about their experiences with the Suffolk Regiment in training and in the trenches. Extensive quotation from the letters, linked to official accounts of military operations in 1914-16 as well as the modern literature on the conflict, helps to locate their individual narratives in the larger history of the Great War. This website is a revised and updated version of a book with the same title, written by a nephew of the brothers on behalf of their families and privately published in 2008. Grundisburgh (‘Grunsbruh’) is a relatively large village in East Suffolk, about 80 miles north-east of London, 6 miles north-east of Ipswich, and 4 miles north-west of Woodbridge. In 1911 its population was 743 but the number of residents has doubled in the century since then. 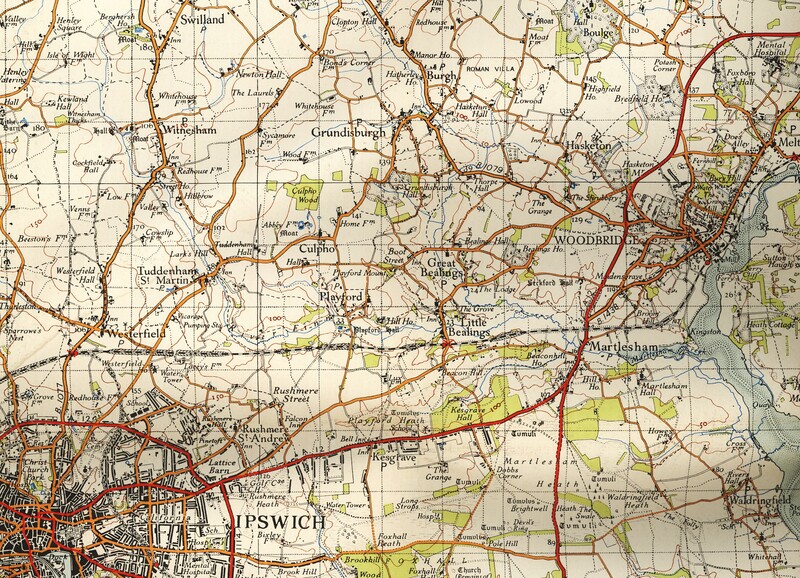 Reproduced from the 6th Edition Ordnance Survey map (1946, fully revised 1930, roads 1948). The Goodchild family home “The Fens” is located at the southernmost end of the village, just above the “b” in Grundisburgh Hall.